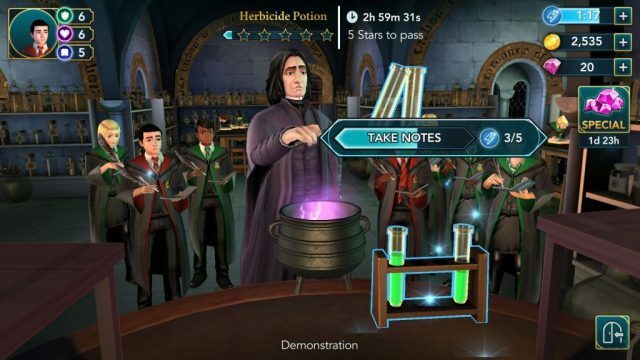 Hogwarts Mystery is probably the first official Harry Potter game to hit the app stores. Developed by Jam City, this brilliant adventure RPG lets you explore the castle, learn powerful magic spells and master the art of brewing potions, make new friends and duel against rivals. As a new wizard, you will also be investigating the sudden disappearance of your brother and the mysterious “cursed vaults”, but there are several things to do mysteries to solve in this game. Gameplay is somewhat similar to Marvel Avengers Academy. You will have to complete actions to finish lessons, story tasks and side-quests. Actions involve tapping glowing objects. Tapping the action bar lets you complete tasks and earn stars. You will also be helping your friends to gain their trusts. The most frustrating part of gameplay is that energy takes time to refill and without it you can’t complete actions, but we have come up with a list of secret areas that contain energy. 1. Earning HP is not so hard. You must attend classes to learn various potion brewing and spell casting lessons. Completing special tasks such as helping a friend may also let you be in the good books of professors who might award you lots of points for that one noble deed. However, your rivals will sabotage your dreams of winning the cup and you might lose points. 2. When you attend a class, you will have to pass it by earning a certain number of stars. You must complete simple actions to earn stars. Make sure you get the required number of stars to complete a lesson before running out of time. If you fail to reach your target within the stipulated time limit, you will lose points, which will be deducted from your personal score as well as from your house. You surely don’t want that to happen, so make sure you pay attention to the timer and the minimum stars needed at the top of the screen. 3. When you begin a lesson, you must tap a glowing object or a person to start an action. The action bar will appear on the screen. Tap it to fill the bar and complete an action. Certain actions will require more taps than others. Make sure you have enough “Energy” to complete them. Every time you tap to fill the action bar, you consume 1 energy orb. The energy bar at the top-right corner of the screen shows how much energy is consumed/remaining and how many minutes or seconds are remaining to regain energy points. When you get a full energy refill, the game will notify you so make sure you turn on notifications. 4. You get rewards for earning stars. When you get one, you can choose your reward, which could be anything from coins to attribute points to energy (rare). After receiving a star, you will have to complete certain quick-time actions, answer questions or trace a symbol on the screen to move to the next learning stage. These are fun tasks that appear soon after earning a star. Completing a quick-time action on time, giving the right answer and tracing a path successfully will earn you extra attribute points. When the lesson ends and you have successfully earned the required number of stars, you get bonus rewards in the form of attribute points or coins. You also receive house points. Tap the “Collect” button to get your rewards. 5. You can increase your energy cap by leveling up. In the beginning, the max energy would be 24, but as you progress and level up your character it will increase to 25 and so on. Complete story tasks and quests to get XP. You also get XP each time you tap on an action button. You will gain a level when the XP bar is full. You receive rewards such as diamonds and unlock new wardrobe items upon reaching a new level. Have a look at the time limit, the number of stars required to complete a lesson and number of energy points you currently have before tapping the “Start” button to attend a class. Lessons are time-based and longer classes will give more rewards than shorter classes. Normally, a 1 hour or a 3 hour class usually has fewer star requirements and can be easily completed with 8-9 energy points in hand. You can get 1 house point for each stars earned. Once you earn the first star, you can wait for the class to finish or use some more energy to get bonus stars. If you want to complete an 8-hour class, then you will have to earn 5 stars to pass it. I would recommend completing 3-hours classes as you will have more time to get stars. In a 3-hour class, you will normally need 1 star to pass but you can take your time to earn 2 extra stars to get bonus rewards. Even if you haven’t earned bonus stars because of low energy or you had less time to complete it, you will still complete the lesson. 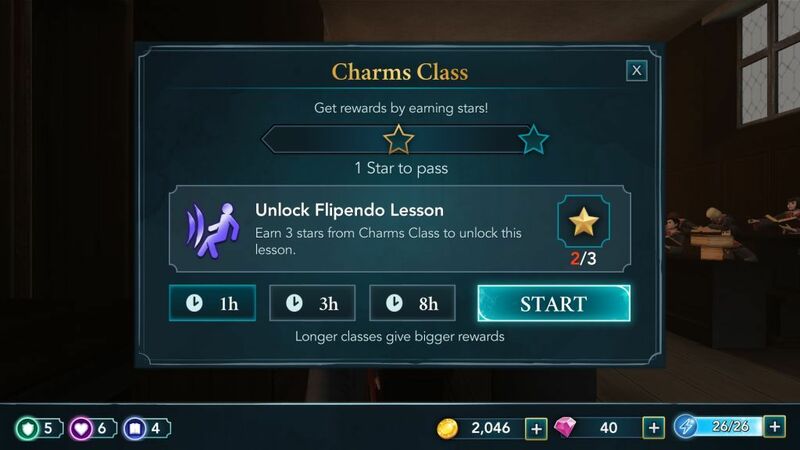 Completing a 1-hour, 3-hour and 8-hour class will let you earn stars, which is then used to unlock an all-important lesson. Passing a crucial lesson is important as you learn a key spell or potion brewing, which can help you in your story tasks, side-quests or dueling missions. In 1-hour or 3-hour classes, you will need a star or two to pass a lesson. You must earn the minimum star required before the timer runs out to avoid points deduction. But just don’t leave a lesson after earning the required star. Keep completing actions to get bonus stars. You get 1 house point for every star, so don’t ignore them and earn all stars in a lesson. This way you can get more points that will help your house reach higher ranks. As simple as it sounds, being a good student is not easy as it requires choosing the right dialogs in a conversation, helping friends and respecting professors. At times your total points will be in the negative and this usually happens when a rival tries to make you look bad in front of professors. A professor may deduct 20 points, which can be a big blow not only on a personal level but also for your house. Don’t worry. You will have plenty of chances to redeem yourself and earn more points. Keep learning new lessons to earn house points and most importantly, don’t be disrespectful to your professors. Also, complete side-quests. You never know a professor might award you 20 points for your good deeds. There was a quest called “Afraid to Fly” where I had to encourage Ben Cooper to attend a flying class and Madam Hooch gave me 20 points for being supportive to my friend. Keep an eye on such opportunities and make sure you take the right decisions to get more points. Don’t be rude to your professors and you will see how easy it will be to earn points. 1. Complete all lessons, including those lessons that will unlock an important class. 2. Choose the 3-hour lesson instead of a one-hour lesson if you want to earn more points. Better, choose an 8-hour lesson to earn 5 points. Because you have eight hours to complete a lesson, earning five stars won’t be difficult. Just pay attention to energy refills and complete actions frequently to keep earning stars until you finish the lesson. 3. Complete all actions to earn bonus stars. You will get extra points. 4. Finish all story quests and side-quests. After completing a quest, your energy bar gets a full refill. You can then begin a lesson to earn points. 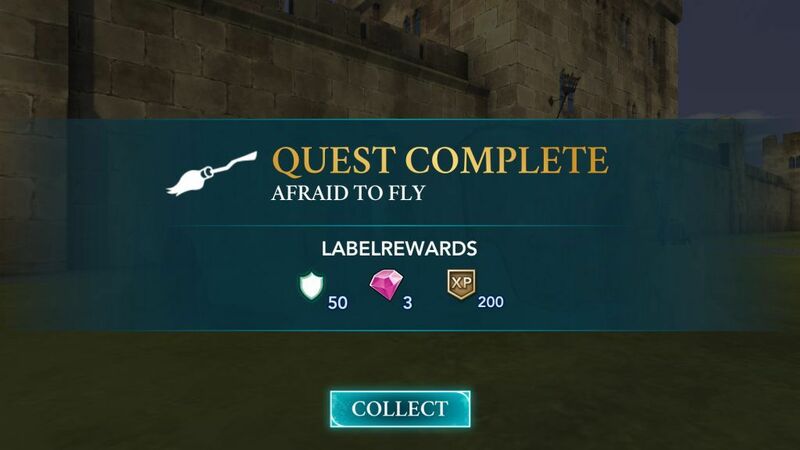 Afraid to fly quest gives 20 house points in total, true, but not all 20 to your house. Madam Hooch gives 10 points to Gryffindor and 10 points to whichever house you are in. Correction – 4. You get a full energy refill after leveling up your character.